Feb. 11, 2009, 11 a.m.
By Joshua Benton @jbenton Feb. 11, 2009, 11 a.m. The Kindle is going to fail. It is not “the iPod of books.” It will never be. — I’m a nerdy guy. And I’m a writer. I work at Harvard, which is filled with nerdy people who are writers. I write about the intersection of writing and technology for a living. I’m a classic “early adopter” for tech. I buy a lot of books; my girlfriend is editorial director at a book publisher; I have lots of friends who’ve written books; and I’ve got a variety of fiction and non-fiction book projects of my own, in varying states of completion and disarray. I say all this to illustrate that I am the exact target audience for the Kindle — precisely the mix of book reader and tech lover who should want one. And yet, 15 months after the Kindle, I have not seen one single Kindle in the flesh. — I’m spending a couple days at the O’Reilly Tools of Change for Publishing conference in New York City. It’s a conference for people in the publishing industry who are interested in books’ digital future — lots of sessions on ebook publishing models, online reading habits, XML best practices for long-form content, and so on. (I’ll write a lot more about the highlights here over the next couple days.) If there is anyone who is more of a perfect target for the Kindle than me, that person is here. If Amazon can’t win in this room — people willing to spend two or three days sitting through sessions on XML and such, people who love books and who want to navigate through the coming digital thicket of their business — then the Kindle ain’t going nowhere. As I wrote the other day, the distribution model behind the Kindle is much more likely to be a success. But I think Amazon’s battle to expand people’s three discrete screens — cell phone, computer, TV — into four is headed nowhere. POSTED Feb. 11, 2009, 11 a.m.
Benton, Joshua. "Why the Kindle will fail." Nieman Journalism Lab. Nieman Foundation for Journalism at Harvard, 11 Feb. 2009. Web. 18 Apr. 2019. Benton, Joshua. "Why the Kindle will fail." Nieman Journalism Lab. Last modified February 11, 2009. 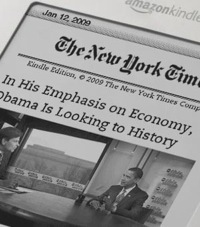 Accessed April 18, 2019. https://www.niemanlab.org/2009/02/why-the-kindle-will-fail/.